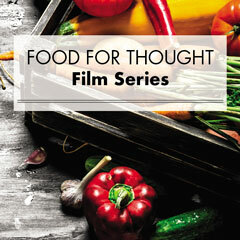 The Urban Food Systems Program at Kansas State University's Olathe campus will host "Food for Thought," a free film series featuring food related documentaries from around the world. Each film screening will be followed by a panel of experts from academia, Extension, community members and nonprofit partners. "Food for Thought" will take place on the second Thursday of every month at K-State Olathe 22201 W. Innovation Drive, Olathe. Each film will start at 6 p.m. with a panel discussion immediately following the film. The first film in the series, "Food Matters," is at 6 p.m. Thursday, March 14. This film examines how the food we eat can help or hurt our health. Nutritionists, naturopaths, doctors and journalists weigh in on topics organic food, food safety, raw foodism, and nutritional therapy. Panelists include Crystal Futrell, extension agent at K-State Research and Extension in Johnson County; Lydia Kaume, extension nutrition specialist at University of Missouri Extension in Jackson County, Dr. Alicia Johnson, naturopathic doctor and acupuncturist at Aspire Health KC; and Leigh Wagner, integrative and functional medicine dietitian. This series is a project of the Master of Science in horticulture with an emphasis in urban food systems program. This degree program focuses on how the urban food system impacts economic development and provides a source of nutritious, safe food grown locally/regionally. The specialization places an emphasis on sustainable agriculture, food systems project management, and safe food production in an urban environment. For more information, visit the film series website or contact Heather Woods at 913-307-7365 or hlwoods@k-state.edu. Thank you to Balls Food Stores for supporting this event. All donations will go toward the graduate students of the Master of Science in horticulture with a specialization in urban food systems including programming, tours, community workshops and more.